Dignity Washable Men's Boxer with Built-In Protective Pouch for Overactive Bladders. Dignity Boxer Shorts by Hartmann USA are 60% cotton and 40% polyester. 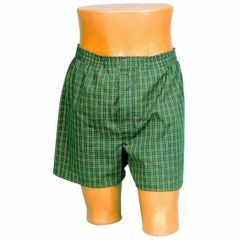 Men's cotton blend boxer shorts feature a special floating protective pad support with “Leakage Lock”. Made to hold a variety of pads and liners, and works especially well with ThinSerts Liners or Briefmates by Hartmann as well. Comes in an attractive plaid pattern. Medium: Fits Waist: 34 - 36"
Large: Fits Waist:38 - 40"
Extra Large: Fits Waist: 42 - 44"
Long Term User. Mobile handicapped. Elderly. I have used boxer shorts and pads for years. The boxers are not as comfortable as the briefs. Feels like you are wearing a swimsuit. The sewn-in pouch fits too snugly in the rear. The briefs fit much better and feel like you are wearing a standard Jockey brief. Highly recommend them.